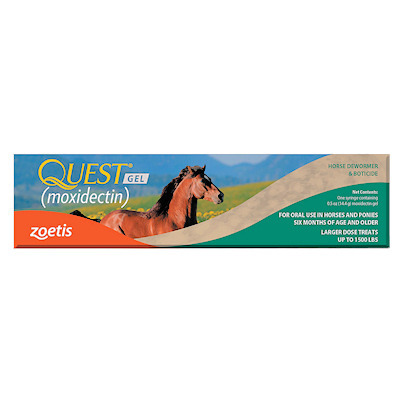 Quest Gel (Zoetis) contains 20mg/ml of Moxidectin,a distinctly different class of dewormers. Quest Gel is very effective in the treatment and control of large and small strongyles, encysted cyathostomes, roundworms, pinworms, hairworms, large mouth stomach worms and bots. Safe for horses, breeding mares, stallions and foals 6 months of age or older. Do not use on horses under 6 months of age. Quest Gel suppresses strongyle egg production for 84 days which means less pasture contamination. This unique gel melts in the horse's mouth to prevent waste. One syringe deworms up to a 1,150lb. horse.